—Is that information you’re requesting going to be published this Saturday?, certain official asked me. —No, it’s going to be published in our website, I answered without hesitation. —So, nobody is going to read it. I thought to tell him he was wrong, that nearly 50% of our online readers are in Cuba, and that it is the website and not the printed edition which people read more. I thought to convince him with data and statistics, but then I remembered what practice has coined: the risk of writing about Internet in Cuba is that some readers understand, and others —the vast majority—, don’t. Fortunately, despite the exorbitant cost of accessing the Internet, the country turns every day less disconnected, and there’s even who uses @teleSURtv-style terms. Nevertheless, the presence of Escambray on Internet dates back to 2000, when a team of only four or five people dared “to get down from a cart drawn by oxen to get into a spaceship”. This is the way how the change was defined by Katia Monteagudo, the then vice-director of the journal, now living in Mexico. A computer, an informatics expert without a university degree, but who was great, a team of reporters and the leadership made up the first staff of the website, which had to swim upstream until getting the official permissions. The informatics security certificate took over three months to be ready. “Our presence in Internet was sort of clandestine in the beginning, because the permission was delayed. In the whole province there was only access to Internet in the then Company of Informatics Services, which we finally joined”, she added. Juan Antonio Borrego, director of Escambray since that time, describes the birth of the web page with a very revealing metaphor: “It was sort of countryside Internet. The journalists had to write for the website, but they couldn’t see their work published. The articles were saved in a diskette and were taken to the only computer connected to the Internet. Thus, we realize we had to create a network of our own, with access to the cyberspace. Much has rained since the times in which the webpage was developed in HTML and updated using the FrontPage tool. Other changes took place like the design and the successive migrations of platforms, first Plone and then WordPress. Reporters and collaborators have contributed to enlarge the database of Escambray, where local, national and international news are published. 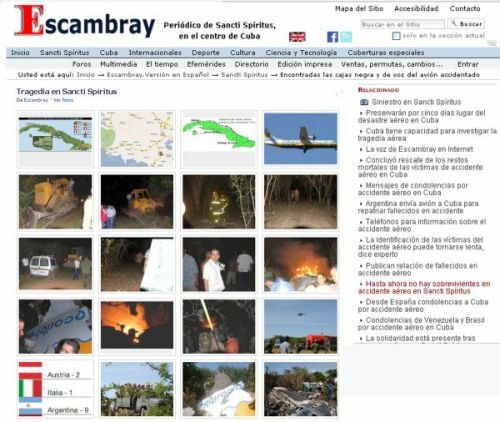 But the air crash that took place in Mayabuna, near Sancti Spiritus, on November, 2010, meant a change in the history of onlineEscambray. “At that very moment we realized the significance of keeping the world informed about what was happening in Sancti Spiritus”, said Borrego, who, all of a sudden, found himself searching for news, and serving as source of information for international media. Internet users also chose the Mayabuna accident as the most relevant event published inEscambray online in these 15 years. Escambray newspaper has also managed to gradually open its path to Facebook, Twitter,Flickr and other social networks which have availed us to promote our work and to structure communities of readers with common interests that frequently visit the web page. About how much it takes to keep the digital newspaper properly updated can bear witness Rosario Sánchez Jacobino, journalist and editor who publishes texts and photos day and night; Aracelia del Valle Macías, translator and editor who vehemently defends the English version of Escambray; and Marlys Rodríguez Francisco, translator and community manager, a sort of “one woman band” who cares for the positioning on social networking sites. The questionable interest of Internet users towards quite a number of local stories; the lack of data which in certain cases hinders the understanding of the whole phenomena; the shortage of multimedia products and even the underestimation of information sources in relation with the real scope of the website, are among the dissatisfactions still present in the online newspaper department. According to the management of the journal, after having fought a hard battle indoors, it has been possible to gradually eliminate the barriers between the printed and the online editions of the newspaper. It was November, 2001. In Havana’s Convention Palace, Sancti Spiritus delegates to the 2ndWritten Press National Festival were surprised with the award granted to Escambray as best digital newspaper. The recognition was received from Fidel Castro. From that moment on, Escambray staff raised its self-esteem. Lots of acknowledgments have come after that, but the greatest of all has been its permanency, which, according to Katia Monteagudo “is the fact of having been updated every day during these 15 years. I admire its capacity not to fall behind and to function as the most worldwide of newspapers”.